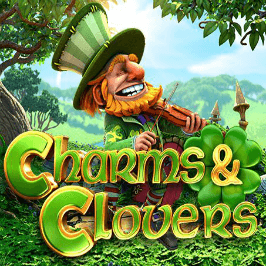 Ireland’s symbols of luck and fortune have been used in countless online slot games, but Charms and Clover adds a brand new spin with a special sixth reel. This combines four rows with over 40 paylines. 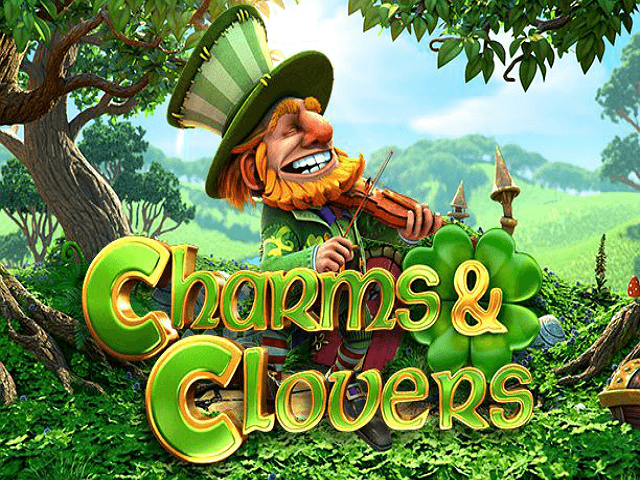 Charms and Clover software developer Betsoft Gaming has crafted a slot bursting with bonus features that will soon have you hankering for a trip to the Emerald Isle itself. Check out our Charms and Clover slot review to find out how exactly that pot of gold could end up in your hands! Charms and Clover invites you to wander the magical Irish countryside of ancient lore. Think four-leaf clovers, cheerful leprechauns, and rainbows leading you to that brimming pot of gold. Software provider BetSoft has held nothing back in terms of the slot's design, either. Both icons and characters are rendered in 3D using innovative Slots3 software. Your ever-present leprechaun companion smiles to the left of the reels, chuckling and flipping his lucky coin as you go about spinning. With a solid return-to-player (RTP) rate of 95%, you won't need the luck of the Irish to win big. The obvious difference between Charms and Clover and other online slots is the inclusion of a special sixth reel. Not only does this add extra drama, but makes it easier to strike two or more symbols on the same payline. The last column is also significant: this is where the magic of the bonus rounds happens. If you land one of the four special symbols stacked on the sixth reel, you'll discover a corresponding bonus round stacked with golden opportunities. 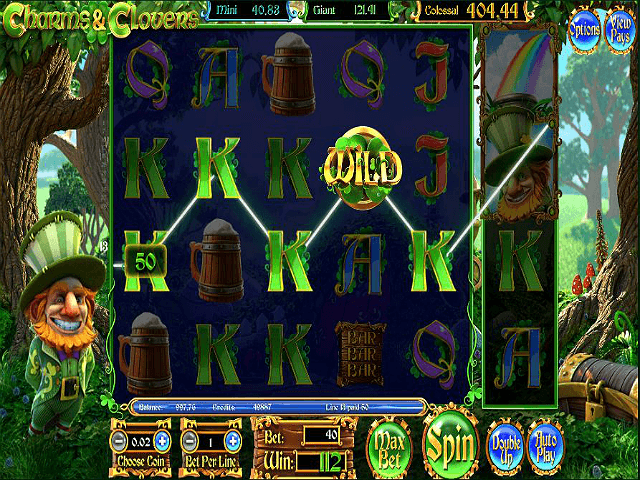 Charms and Clover features standard card symbols like J, Q, K, and A, as well as higher scoring icons like pots of gold, pints of stout, and lucky leprechauns. Don't forget your wild card – the four-leafed clover – which can substitute all symbols save for those in the bonus round. Match all six of the wild symbols across the pay line and you could net up to 10,000 times the original wager. There are four bonus rounds: Mega Symbol, Pots of Golds, Golden Bonus, and the Money Wheel. Watch out for the 3x3 leprechaun symbols in Mega Symbol – they randomly activate to offer you a higher chance of winning. 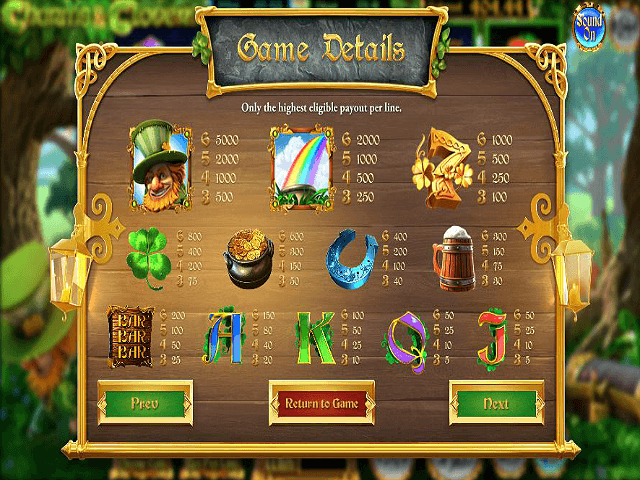 Pots of Gold works in a similar fashion, granting eight free spins, and boasting more wild symbols in play. Landing the Golden Bonus will see you follow the Leprechaun over the rainbow, where there are five pots of gold to choose from. Each carries various multipliers, with the highest offering 20x the total bet. Striking the Money Wheel gives you the chance to spin it, which could lead to a 4x multiplier on the bet, or a chance to aim for the progressive jackpot. Charms and Clover is also a progressive jackpot slot, offering even more ways to win. 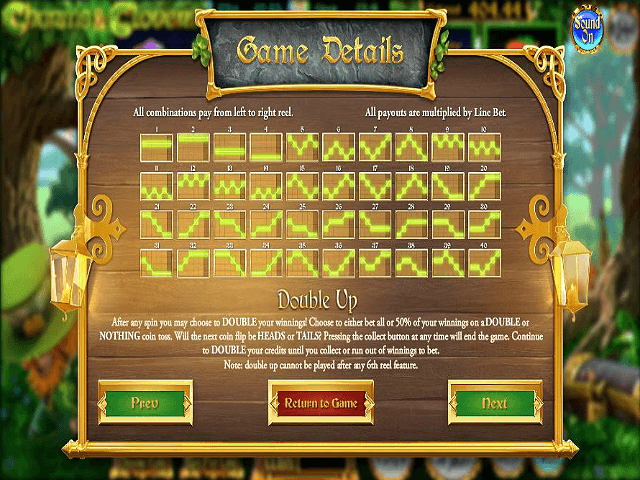 There are three progressive jackpots on offer – Mini, Giant, and Colossal. These are up for grabs once you put down the max bet, and will appear during the Money Wheel Bonus. If you land on either of the golden Mega Wheel sections, you'll unlock a new wheel. Spin this for a chance to win one of the three jackpots, which can range from a couple of hundred to several thousand credits. If you like Charms and Clovers - You'll like these slots too!